In a heavy saucepan, combine oil and honey over medium heat, stirring until warmed. Remove from heat. Stir in vanilla. Add oats, pecans, pumpkin seeds, sunflower seeds, coconut, flaxseed, cranberries and chocolate chips. Stir until well coated. 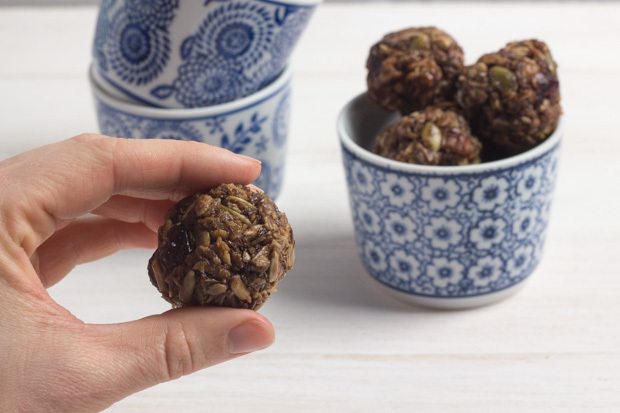 With dampened fingers, firmly form mixture into bite-size balls. Let cool completely on rack. Store in an airtight container for a week or freeze for longer storage. Serving Size: 2 bites. Each serving contains 1/2 tsp (2 mL) of flax.